The Acholi are arguably Uganda's third largest tribe. Click here for more Traditional Marriages in Uganda. Unitary, determined, ambitious or candid; any of these terms might be a fitting description for the Acholi. For a long time, this Ugandan tribe has been so culturally diverse that it is hard to describe Uganda without mentioning it. Occupying the northern Uganda districts of Gulu, Kitgum and Pader, the Acholi (who are arguably Uganda's third largest tribe) have for long maintained unique cultural traditions that date from as far back as the times of their great ancestors; Gipiir and Labong. These traditions are highlighted by the many ceremonies the Acholi hold, one of them being marriage. Nyom (marriage) in Acholi is a lengthy process which begins with a boy seeing a girl and starting to court her. She is typically expected to be coy and hard to get in order to protect her morally upright reputation. The boy eventually wins her over as several encounters lead to her finally giving in and accepting the boy's bead or a bracelet, a sign that she has agreed to be married to him. This pursuit is known as luk (getting to know each other). Expression of love among the Acholi youth is mainly through 'blood packing' (making cuts on their bodies and tasting each other's blood). This is the Acholi version of cementing a relationship. In the event of a death, the surviving partner demands that a sacrifice in form of a goat be offered to the gods and the corpse is taken through the back door of the house. This partner never sees the corpse again. A boy, on meeting a girl that takes his fancy, seeks the company of a friend and pays the girl's home a visit. The two boys are taken to the girl's mother's house. The girl's mother vacates the house, leaving the groom-to-be alone with the daughter to chat, after which the girl gives the visitors a push on their way out. Later, the mother asks her daughter to identify the visitors, at which point the daughter announces the boy's interest in her, and her opinion of him. If it is positive, the mother goes ahead to inquire about the boy's clan in order to verify that the two love birds are not related by blood. The girl always looks out for the boy who owns plenty of cattle. However, a young man chiefly depends upon his lineage to get both the permission to marry a girl and the ability to provide the material goods required to pay her bride price (which is a must in the Acholi tradition). After the visit, the boy satisfied with what he saw, tells his family, who subsequently find out about the young lady's clan and family's status socially. When the boy's family agrees, he is given a green light to marry the girl. He informs her and she in turn, announces to her parents that special visitors will be arriving on a given day to conduct the marriage ceremony. The girl's mother then informs the girl's entire family. In preparation for the visitors, the structures in the girl's homestead receive a new layer of mud mixed with cow dung. Seats (mainly animal hides) are set. On the agreed day, the boy, his father, brothers and other family members (as invited) go to the girl's home and are welcomed into the house of her mother. The visitors are not allowed to stand, but kneel throughout the introductions, with the girl's father asking the questions. He asks the visitors who they are and the boy's father responds appropriately. The girl is asked to ascertain she knows them. 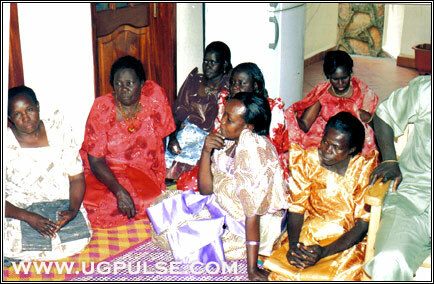 A group of Acholi ladies watch the proceedings at a marriage ceremony. The items to be delivered as bride price (which is a practical way of saying thank you to the girl's mother) are discussed and a specific date set for the delivery. This though, does not necessarily mean that the items must all be brought once. Installments may be accepted. After this ceremony, the girl becomes part of the boy's clan. It might take a while to complete dowry payments but the girl's status changes from nyako (girl) to dako ot (wife) immediately. Nyom (dowry) can take the form of cattle, goats, sheep, household items or money. Often, the girl's dowry is not consumed/spent but saved to offset her brothers' dowries when it is their turn to marry and pay. Dowry refunds are made in the event of a divorce, although the value refunded depends on the terms agreed upon when the dowry is paid. Although marriages were sometimes organized without the consent of the boy and the girl in the past, such scenarios are rare today, with most people embracing the modern ideal of freedom of choice. In the past, if a father preferred a friend's daughter over other girls for his son, it was possible for the two fathers to strike a deal and compel their children to get married to each other. Because it was often the father's wealth that afforded the boy the bride price, there was little he could change. The Acholi attach so much significance to the marriage ritual that failure to marry is considered a curse (or an abnormality) and the elders are called in to monitor events. Childlessness is counted as one of the most serious misfortunes to befall a couple, with women typically taking all the blame. In such cases, the marriage could be dissolved or the husband allowed to take another wife. For the Acholi, children are the ultimate goal of any marriage. Indeed, historians say that an Acholi couple of the past could not set up a home until their first child was born. Until then, the newly married couple lived in the groom's mother's house. In cases where a girl conceived before the official marriage, the nyom would not take place until she had given birth, to confirm that the child belonged to the groom. Rejoicing and celebrating a new marriage is one thing the Acholi can't fail. Chanting and singing to the sound of sauce pans hitting the ground, congratulations are offered to the new couple as they are bid farewell to their lives as singles. This rejoicing is called nakub kub. Polygamy is a highly regarded arrangement and a man can marry as many wives as he afford. The man is always the head of his family and his authority is virtually unquestionable. Men carry out such duties as farming, hunting and ensuring the general well-being of the family, while the females do domestic chores like cooking. The Acholi are one of the few tribes in Uganda where family lineage is highly valued, the reason most men live closer to their parent's homes and clans. This makes closer, more cooperative communities which share almost every activity. It is typical to have a big homestead with a father's house surrounded by his sons' houses. This exceptional lifestyle of the Acholi, however, has been disrupted by the two decade-long Lord's Resistance Army rebellion that has left most of the Acholi population displaced and their cherished traditions on the verge of extinction. Burite is an upcoming writer, currently pursuing his degree in Mass Communication at Islamic University in Uganda (IUIU), Mbale.